In case you have full pantry of stewed cherries nobody wants to eat, you’re not the only one who have such a problem! Although stewing is a great way to use up surplus fruits you don’t preserve all the wholesome enzymes, vitamins and minerals. There is much better way to process a bumper crop than stewing without losing any healthy substances. Try to prepare a fresh cherry juice! Cherries are full of natural sugars, vitamins, minerals and antioxidants. Since stewing is not the best way to process your crop, consume cherries right after harvesting. The perfect way to get a huge amount of vitamins and minerals is drinking of fresh cherry juices! The darker cherries are, the more magnesium, potassium and other minerals you can take in. Fresh cherry juices have mainly detoxifying effects, help the organism to get rid of harmful substances and slow down the aging. And what are the main wholesome effects of cherries? 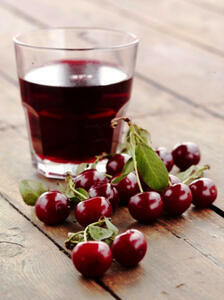 One glass of fresh cherry juice a day helps you to fight toxins. You will sleep better and your body will be stronger to struggle with lifestyle diseases. Moreover, the fresh cherry juice is very tasty. What a pity that the season of cherries takes just a couple of weeks! Before adding cherries you have to pit them in order not to damage your juicer. In case you have a blender, you don’t have to pit cherries but you should strain the final juice. If you don’t like plain cherry juice you can add apples, strawberries or other kinds of fruits according to your taste. Drink your juice right after juicing. It loses all the wholesome substances right away. During hot summer days you can also add ice cubes and mint to cool down. To fully enjoy fresh cherry juices it's handy to have an appropriate juicer, which enables you to get the best taste for your drink!